Well, that was just a complete tour de force. Obviously, not every Childrens Hospital can be that coherent and stunning. Half the fun of the show is how freewheeling and disjointed it is, its utter disregard for sensible plotting, etc. But “A Year In The Life,” written and directed by David Wain, could well stake a claim to being the show’s best 15 minutes. Because it dashes through so much so quickly, it could have suffered from the typical pitfall of not giving its whole cast enough to do. But pretty much everyone (save Megan Mullally, who’s missing from the action) got something awesome to do. Given one year to get the hospital back into the black by an imposing CEO (played by the instantly recognizable Fred Melamed), we chart Sy’s efforts through the seasons, pausing on all the big holidays to watch everyone’s little dramas play out over and over again. Sy tries to make the hospital money by renting out its roof copter to businessmen and tourists, so throughout the episode the hospital turns more and more into an airport (a subtle, building joke that’s capped perfectly by Owen’s air traffic controller uniform at the end of the episode). Owen pesters Lola for a date on every holiday, thinking up thinner and thinner metaphors to try and get into her pants. This finally sparks a revelation near the end of the year that sees her run from Pittsburgh to southern Brazil (where, as Glenn reminds us, “as we both know, is where we are, Brazil”). Just to tell him that she doesn’t want to go out with him. Owen gets it—she’s a modern woman, tells her, “Okay.” Of all the episode’s recurring jokes, this probably was most at risk of falling flat, but I thought Erinn Hayes and Rob Huebel did a good job selling it. Glenn is plagued by guilt over the hospital sheltering evil Nazi doctor Josef Mengele (Philip Baker Hall, who can, of course, do no wrong). The show hasn’t taken much advantage of its South American setting this season, but that was a cute take on a classic joke about the continent. I also liked Fred Weller’s appearance as the investigator from the Simon Wiesenthal center. 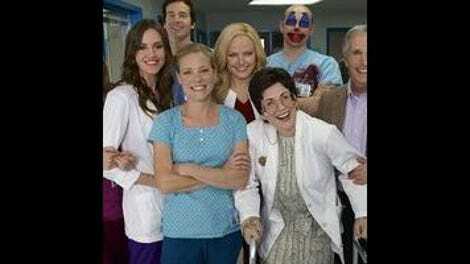 This was an episode filled with great character actors—the more Childrens Hospital makes such weird one-off hires, the better. Perhaps best of all is Blake’s flirty relationship with Dory for the first two holidays, which is quickly consummated in a broom closet and then leads to pregnancy, which the two handle in a very businesslike fashion with no raised voices or hurt feelings. When Dori gives birth to a clown-faced baby at the end of the year, Blake calmly hands her a check, and it’s one of the biggest laughs of the night. I briefly thought about halfway through the episode that the holiday format was going to be abandoned when Glenn went on his long, shell-shocked walk through the hospital (which included two costume changes for Nurse Kulap and one for Glenn, into a Rocky Horror Halloween outfit). That kind of rug-pull would be classic Childrens. But instead, Wain just tweaked the format a little so it didn’t get too repetitive, and it really made the last “act” of the episode dazzling. As silly as this show can be, it excels at presenting that silliness with poise. I doubt we’ll see a better Childrens episode this year (although, next week, Jon Hamm’s back. Woo! ), but I’m satisfied enough with this one to watch it over and over again.